Internet retailers’ profitability (measured by the return on capital employed) is generally higher than that of bricks and mortar (B&M) competitors. The rapid growth of ‘e-tailers’ such as Amazon has been made possible partly because the capital expenditure they require to increase capacity is much lower than in B&M retailing. Some consumer goods such as newspapers are now supplied ‘virtually’ (i.e. online), thereby dramatically increasing supply capacity and reducing marginal costs of production to near-zero. Most national retailers that I speak to plan to grow their internet sales, while scaling back the rate of store openings. This, coupled with the growth of internet-only operators, could result in much lower levels of business investment per unit of output compared with the past decade when retail capacity grew quickly (see Chart 1 below). More generally, the transition to an e-commerce economy could see significant structural changes, including lower levels of business investment and higher levels of capital productivity. The expansion of e-commerce has yet to result in any loss of aggregate supply capacity in B&M retailing: indeed, rather the reverse. As a result, capital utilisation of many B&M retailers has declined sharply. Goods retailers’ labour productivity growth has slowed in recent years, in part because multi-channel retailing (ie including both B&M and internet sales channels) is relatively labour intensive. By contrast, pure internet retailers of commoditised, higher-value items such as white goods generally have relatively high labour productivity, and many B&M retailers have exited these markets. The use of e-commerce allows retailers and consumer-service providers to establish national (and international) supply chains and customer bases much more quickly and cheaply than traditional business models, with much less need for investment in tangible assets such as stores, leisure facilities, warehousing and transportation. (These advantages often apply to business-to-business services as well, if to a lesser degree. For instance law firms can provide business clients with a web-based service from a single office.) This suggests that as e-commerce continues to gain market share, the aggregate business investment to output ratio in the economy may come under downward pressure. Retailers increasingly interact with their customers through more than one ‘retail channel’ per transaction. These channels include B&M stores; online sales transacted via the shopper’s own computer, or mobile device (“m-commerce”); retailers’ apps; telephone sales; and social media (“s-commerce”). “Click and collect” – where the customer orders online then collects goods from a nearby store – is the fastest growing platform. What can we learn from the consumer services sector, which has been a comparatively fast adopter of e-commerce? A virtual service requires less labour than one provided in-store, with the consumer’s computer input displacing the administrative services of the store worker. And aside perhaps from the extra investment in high-speed broadband and computer servers, the marginal costs of providing a service online are typically negligible, with almost no capacity constraints. Online services thus often have much higher labour productivity, and lower marginal costs, compared with their B&M counterparts. Perhaps the best example I know of a service rapidly moving online is high-street banking. UK bank and building society branch numbers have fallen over 40% in the past 25 years, a trend likely to continue. They are not alone. Household-insurance brokers with town-centre offices have been replaced by ‘aggregator’ websites. Hotels and airlines now interact directly with consumers, displacing many high-street travel agents. And online gambling is rapidly displacing the traditional bookmaker. Surprisingly perhaps, the rapid growth of internet retailing has coincided with continued expansion of B&M retailing. This could be part of an evolutionary phase where traditional B&M retailers are adding capacity as a fight for market share. But the enormous advantages of e-tailing in many consumer sectors will surely mean that at some point there will be a shake-out of excess capacity. This process could however take many years and act as a drag on profitability in the meantime. 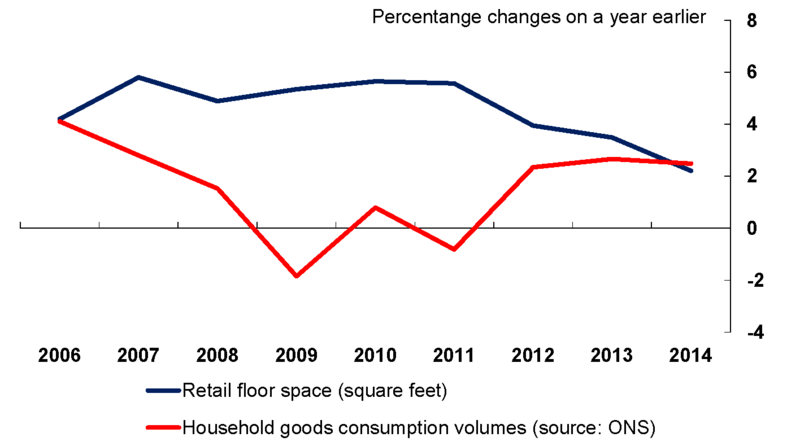 Capacity utilisation in the retail sector has declined sharply. Figures published in their annual reports show that the total square feet of retail space of Tesco, Sainsbury, WM Morrison, John Lewis Partnership and Marks & Spencer (which together account for around 30% of UK retail sales), grew by over 50% in the decade to 2014/15. But my estimates indicate that, whereas sales volumes per square foot — a measure of capital utilisation — rose by an average of nearly 4% per annum from 2004/05 to 2006/07, they declined at an annual average rate of over 2% in the following eight years. Official data show that changes in non-residential buildings investment often account for the majority of the variation in total investment in the economy. As I’ve already argued, the capital expenditure of internet goods retailers and service providers is typically much lower than their B&M counterparts, for a given level of turnover. With the exception of some discounters, most national retailers have already grown their estates close to desired levels and are now focussed on developing multi-channel offerings. For example, Tesco’s recent annual report stated that it plans to reduce its total UK floor space slightly this year (compared with a 75% increase in the previous decade) and to slash its UK capital expenditure. Finally, business investment may be further subdued as e-commerce increasingly transforms some consumer goods such as newspapers into virtual services, with a consequent obsolescence of manufacturing and retail/distribution facilities. The above analysis suggests that capital productivity of internet businesses is in general likely to be significantly higher than that of their traditional counterparts. But the picture is more mixed with regard to labour productivity. As we’ve already seen, online services often have much higher labour productivity compared with their B&M counterparts. E-tailers of commoditised, higher-value items such as white goods likewise typically have comparatively less demand for labour for a given level of sales, due for example to the absence of sales assistants. On the other hand, despite innovations such as self-service check-outs, labour productivity growth in supermarkets has slowed. The need to stack the shelves of substantially more retail space over the past decade has hit productivity performance. My estimates of labour productivity for the aggregate of Tesco, Sainsbury, WM Morrison, John Lewis Partnership and Marks & Spencer (where output is proxied by turnover deflated by the official retail sales deflator) show that following growth averaging nearly 3% per annum from 2004/05 to 2009/10, labour productivity was broadly static in the next five years. That is partly because multi-channel approaches including e-tailing can reduce labour productivity — especially for the sale of low-value items such as groceries as it is very labour intensive for the retailer to “pick” the goods off the shelf. Official data show that “predominantly food stores” accounted for about 15% of on-line retailing in 2014. E-commerce is proving to be highly disruptive to traditional business models, and the market share of internet businesses is growing quickly in many industries — especially in retailing and the provision of some consumer services. Moreover, technological innovation in e-commerce is comparatively rapid, for example in terms of broadband speeds and the developments of “apps”. These advances are bringing lots of benefits to the consumer, including more competition and greater transparency of pricing. They are also increasing firms’ capital productivity. But the growth of supply potential in retailing is outstripping growth of demand. As a result, the so-called supermarket price wars are unlikely to go away for some considerable time. Tim Pike works in the Bank’s Inflation Report and Agency Intelligence Division.